To Cite: Khoshmohabat H, Rasouli H R, Danial Z, Ghane M R. Validation of an Iranian Trauma Data Collection Form, Trauma Mon. 2016 ; 21(5):e24686. doi: 10.5812/traumamon.24686. Background: Knowing the direction of traumatic injury is important as the information can help avoid death after trauma. A trauma registry usually entails detailed information about the demographics, cause, intensity of the injury, and the final diagnosis and outcome of the trauma-affected patient. Researchers should be able to evaluate all aspects of trauma injury and the patient’s status. Objectives: The purpose of this study was to develop a trauma data collection form. Materials and Methods: The development of the trauma registry form began in February 2013. The variables were finalized by a team consisting of general and trauma surgeons, specialists in emergency medicine, orthopedists, neurosurgeons, and public health professionals who have special interest in trauma research. The scale was sent to 10 specialists for validation. Results: After assessing the scale validity twice, it was accepted with an integrator agreement of 0.89. The test-retest reliability was assessed in a convenience sample of 20 physicians (Kendall t = 0.97; P < 0.001). Such a high reliability may reflect redundancy of some items. Conclusions: It is essential to establish a secure multicenter trauma registry in Iran for data collection, storage, and assessment of traumatic injury and these registries must be easy to install and use. Knowing the background of traumatic injury is important as the information can help avoid death after trauma. Also, it is important to gather information regarding the severity of traumatic injury as soon as possible in the event there are several trauma patients. A logical decision for a trauma patient must be based on a clear and detailed understanding of the causes, treatments, and outcomes of injury (1). Researchers should be able to evaluate all aspects of trauma injury and the affected patients. One advantage of having a trauma registry in place is that it serves as a statistical model for the assessment of trauma research and that it improves the quality of trauma care and public health. Traumatic injuries are a serious health problem globally, with more than five million deaths reported annually (2, 3). Trauma is the cause of death in young people and the fourth cause of death overall (4, 5). A trauma registry usually entails detailed information about the demographics, cause, the intensity of the injury, and the final outcome of the patient. Researchers should be able to evaluate all aspects of the trauma injury and the affected patients; that is, essentially all phases of trauma care must be assessed. Trauma registries are used in many high-income countries and they promote injury prevention, changing of policies when needed, and assessment of trauma system effectiveness (6). The first recorded systematic attempt to obtain and collect casualty and medical information was ordered by the surgeon general of the United States army in 1818 (7). Computerized trauma registries appeared nearly a century and half later (8), and thereafter expanded and spread rapidly (9) and were finally defined as an essential part of a hospital trauma system (10). 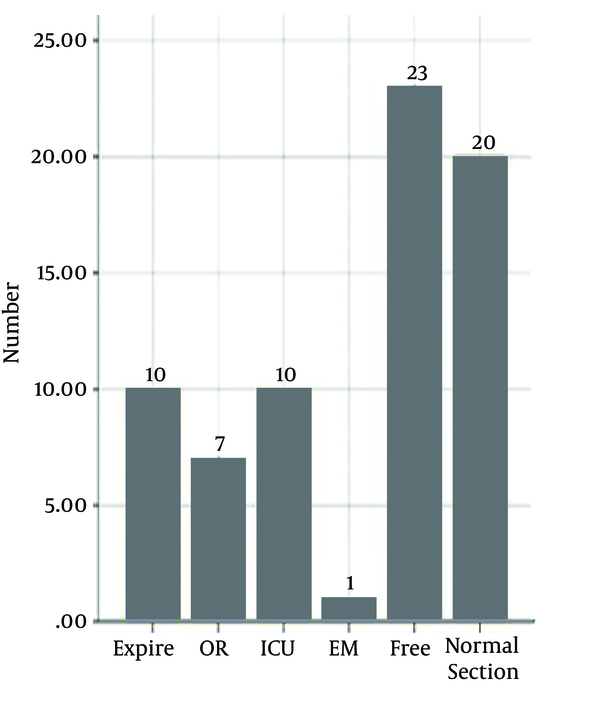 Several scoring systems for mortality risk have been developed for trauma patients (11, 12). A trauma questionnaire can be used early in the emergency room and as early as in the ambulance to estimate mortality (13). Despite broad implementation of trauma registries worldwide, their implementation in some countries remains to be challenging. The purpose of this study was therefore to develop a trauma data collection form for Iran. The development of the trauma registry form began in February 2013. Variables were finalized by a team consisting of a general surgeon, a specialist in emergency medicine, orthopedists, surgeons, and public health professionals with special interest in trauma outcome research. The variables were organized such that they enabled calculation of survival probability and ensured that all the stages of in-hospital treatment were recorded with date, time, and interventions. To facilitate data entry, separate tabs were created to record: 1) demographics, injury details; 2) pre-hospital phase information, including mechanism of injury, initial physiological parameters, first therapy given, neurological signs, pre-hospital time; 3) emergency room (ER) data, including physiological parameters, laboratory findings, suspected pattern of injury, therapy given, offered, sequence of diagnostics; 4) intensive care unit (ICU) data, including status on admission, organ failure, sepsis, duration of ventilation; and 5) final outcome data, including hospital stay, survival, or death. Interventions were documented according to the International Classification of Procedures in Medicine. This study was approved by the ethics committee of Baqiyatallah University of Medical Sciences. The scale was sent to 10 specialists for validation and was validated twice. In addition to evaluating the literature, the investigators conducted face-to-face interviews with physicians about issues specific to traumatic injury. Test-retest was used for assessing the reliability of the trauma register form. The trauma registry form was first pre-tested on 71 trauma cases from April 2013 to December 2013 to check for data entry, errors, and collation of data. The pilot study population included all trauma patients admitted to the emergency room in Baqiatallah hospital during the 9 months of pretesting (from April 2013 to December 2013). Based on the pre-test findings, further modifications were carried out. Random checks of medical charts were performed by the principal investigator to check for accuracy and completeness of data collection during the study and to compare the data input with the actual information (14). Descriptive statistics were used to summarize the distribution demographics in the sample. Data were analyzed using SPSS 20 software (SPSS, Chicago, IL, USA). A P < 0.05 was considered statistically significant. The scale was sent to 10 specialists for validation and was validated twice; it was finally accepted with an interrater agreement of 0.89. The test-retest reliability was assessed in a convenience sample of 20 physicians (Kendall t = 0.97, P < .001). The high reliability may reflect redundancy of some items. 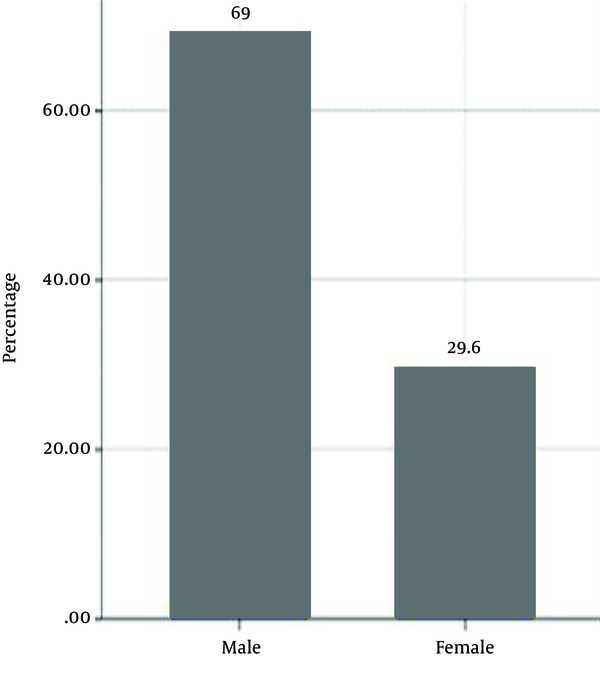 The sample size for the pilot study was 71 patients, of which 50 (69.0%) were male (Figure 1). The Mean ± SD age of all participants was 32.73 ± 16.18 years-old. The difference in age between males and females was not significant (male: 32.73 ± 16.18 years-old; female: 37.19 ± 27.93; P = 0.58). Figure 2 depicts the type of injury. A total of 18 (25.4%) patients were reported as “deteriorating” and 15 (21.1) of these were male. Figure 3 shows the population distribution by final outcome. Regarding the leading cause of injury, car accident was reported in 17 (23.9%); motorcycle accident in 15 (21.1%); pedestrian accident in 3 (4.2%); altercations in 12 (16.9%); falls in 15 (21.1%); burns in 2 (2.8%), and warfare in 3 (4.2%) patients. Among our patients, 36.5% had received pre-hospital care. Most cases of falls had occurred in the third month of summer. All patients had the clinical diagnosis confirmed by radiography. Computed tomography scan was obtained in 44% patients, most of whom had sustained head trauma. 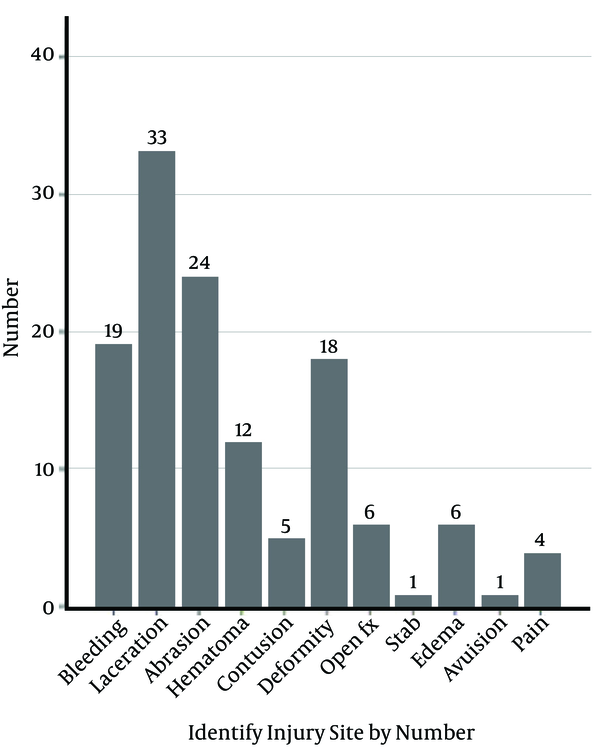 Ten patients died because of severe injuries (Figure 3). Head trauma was the main cause of death in five cases. Analysis of injury severity showed that 71 cases (78.5%) had minor injuries, 20% patients had moderate injuries, and only 1.5% cases reported severe injuries. This paper describes the development of a trauma data collection form in Iran. The enrolled team of trauma experts invested six months to develop a functional trauma registry. A sign of its success was the implementation of the registry in an actual hospital setting where patient care status was documented. The registry variables included injury details, mechanism of injury, initial physiological parameters, therapy offered, neurological signs, findings pertaining to physiological variables over course of time, laboratory findings, suspected pattern of injury, therapy sequence of diagnostics, status on admission, organ failure, sepsis, duration of ventilation, survival, and death. For a trauma information collection system, it is important to create a process for patient identification, data collection, and follow-up. Road traffic accidents (RTAs) in Iran and other developing countries are the leading cause of morbidity and mortality in young men (under 40-years-old) (15-17). A recent report from southeastern Iran stated that most injuries were due to RTAs (15). Therefore, to avoid early loss of life, adequate management of traumatic injury is important. Unfortunately, in our country, trauma registry systems are not successfully implemented; for example, there is absence of appropriate database registries, data entry personnel/research assistants, and health computer experts. Currently in Iran, there is no definitive system for data collection and analysis. One study reported on a software developed Pakistan, with a total implementation cost of US$ 9,600, and it capable of meeting the local demands (18). In summary, this paper emphasizes that trauma registries are essential tools for quality management over an extended period of time and for integrating all plans of prevention strategies into trauma injury control. Another study shows that 90% of the motorcyclists who died had sustained head trauma, and that only 3.1% of motorcyclists had used a helmet for protection (15). Some studies have shown the positive effect of mandatory helmet use laws on mortality and morbidity (19, 20). A mandatory helmet law does not currently exist in Iran and voluntary helmet use is low. In conclusion, trauma registries are worthwhile for improving the care for trauma patients. From the results, it is clear that a greater involvement of the medical staff is needed to improve the quality of the data registered during the early stages of patient care. Authors’ Contribution: Study concept and design: Hadi Khoshmohabat, Hamid Reza Rasouli, Zahra Danial, Mohammad Reza Ghane; acquisition of data: Hadi Khoshmohabat, Hamid Reza Rasouli, Zahra Danial, Mohammad Reza Ghane; analysis and interpretation of data: Hadi Khoshmohabat, Hamid Reza Rasouli, Zahra Danial, Mohammad Reza Ghane; drafting of the manuscript: Hadi Khoshmohabat, Hamid Reza Rasouli, Zahra Danial, Mohammad Reza Ghane; critical revision of the manuscript for important intellectual content: Hadi Khoshmohabat, Hamid Reza Rasouli, Zahra Danial, Mohammad Reza Ghane; administrative, technical, and material support: Hadi Khoshmohabat, Hamid Reza Rasouli, Zahra Danial, Mohammad Reza Ghane; study supervision: Hadi Khoshmohabat, Hamid Reza Rasouli, Zahra Danial, Mohammad Reza Ghane.